From "Realms of Heroism": Two richly attired noblewomen are seated on a carpet on a garden terrace enjoying wine. The principal lady, identified by her more elaborate pearl jewelry, is dark-skinned. She embraces her companion's shoulder with her left arm and holds a small gold wine cup in her right hand. Her companion on the right leans against a deep-red brocade bolster with a pearled tassel and holds the neck of a blue glass wine bottle. Both are dressed in long-sleeved, ankle-length transparent outer garments identified by Waldschmidt as a peshvaj, a Mughal court garment worn over trousers and seen in Mughal paintings (1967, pp. 66-67, ills. 24 and 25). The long gold brocade sash and transparent orange shawl are traditional accompanying garments. Various bottles, brass dishes, and platters are scattered around them. The terrace is otherwise bare, except for a row of red poppies at the upper border and a pale green background beyond. The painting is mounted on an orange paper flecked with gold and a lapis blue outer border. Subjects with women engaged in drinking are popular in Bikaner painting and are repeated throughout the tradition. A close compositional parallel, dated 1666 and painted by Ruknuddin (Goetz 1950, pp. 106, 174, fig. 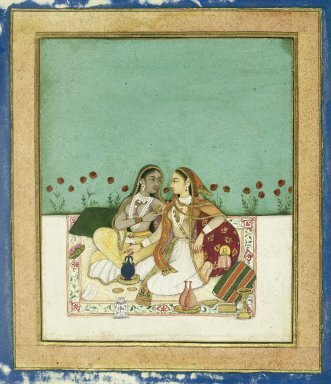 83), which shows a hostess and female companion on a terrace with attendants, is exemplary of the early versions of this subject, painted during the Karan Singh period, when Bikaner was involved in campaigns in the Deccan. Ruknuddin and other Muslim painters who accompanied the Bikaner rulers were influenced by Deccani style in their depiction of facial features, palette, and subject matter. The compositional elements, use of gilding, and modeling of features seen in our painting are descended from that tradition. While Naval Krishna affirms that this painting is in the Bikaner style, he questions an eighteenth-century date because of the thickly applied gold paint and the presence of shading of the figures, which is similar to that of paintings on ivory (personal communication 1991). On the other hand, Andrew Topsfield has suggested that the inventory label written in red ink, pasted on the reverse and independent of the calligraphy, conforms to a type found in the princely collection of Mewar (personal communication, 1991). Inscription drawn in ink and gold in Persian on reverse. The relationship of the page to the text on the verso, with script that is very round in form, remains unclear; perhaps the text is a later addition.